The Dementia Prevalence Calculator has been revised and updated for 2014-15 and presents an opportunity for all health communities to gain a better understanding of their local estimated prevalence of dementia in the community, and among people living in local care homes. The tool enables General Practices and commissioners to establish a baseline by which to set and work toward local quantified ambitions for improvement in diagnosis rates, as set out in NHS Mandate, and inform local joint strategic planning, commissioning, and service redesign and improvement. The dementia prevalence calculator is accessible to registered users including GP practice staff, Clinical Commissioning Groups, Area and Regional Teams and other approved stakeholder organisations at https://www.primarycare.nhs.uk/. To register visit https://www.primarycare.nhs.uk/register.aspx and complete the registration form. A member of the Primary Care Web Tool team will get in touch. If you have any questions contact the Primary Care Web Tool Team primarycareweb@nhs.net. Version 3 of the calculator has been designed with the same look, feel and functionality of the other Primary Care modules, to facilitate ease of use and navigation. From within the DPC module, users can access in-line help, help menus and supporting documentation in the resources section. I am sorry that you have experienced a problem with using the Dementia Prevalnce Calculator. I will pass the practice code (L83095) on to the team working on a new web based version of the Calculator to ensure that this is addressed. I will keep you informed of progress with the development of the web based Calculator. I am sorry that you have experienced a problem with using the Dementia Prevalnce Calculator. Are you able to provide your practice code? If so, I will pass it on along with your feedback to the team working on a new web based version of the Calculator to ensure that this is addressed. I will keep you informed of progress with the development of the web based Calculator. Much to absorb and consider for local commissioning. Working on a housing related project for people with dementia. Just wondering if there is any intention of updating or reviewing the 2007 prevalence rate figures or if you are still happy with that report’s findings. Also can the data be aggregated up to county level for two tier authorities. I will pass on your query regarding the the 2007 prevalence rate figures to the team working on a new web based version of the Calculator to ensure that this is addressed. This will be available soon. I have registered my details to enable me to login and use the tools on the dementia prevelance calculatir. It says i would recieve an activiation email, but as yet i have not recieved this and on trying to login it says my account is not activated? Please accept our apologies for the problems that you have experienced in accessing the Dementia Prevalence Calculator https://www.dementiaprevalencecalculator.org.uk. The activation emails being sent from the server were being blocked by an NHS firewall. This issue is now resolved and you should have received your activation email. Please let me know if you are unable to log in after you receive the activation email. I have registered on the website but have not been sent an authentification email in order to proceed in using the webiste. Please can you advise? Please accept our apologies for the problems that you have experienced in accessing the Dementia Prevalence Calculator http://www.dementiaprevalencecalculator.org.uk. 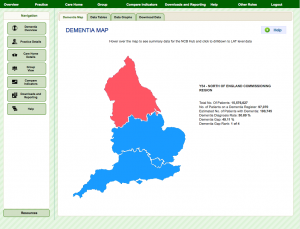 I am using this fantastic tool to work with commissioners regarding dementia prevalence at GP practice level. Please could you confirm that this is correct – and also advise me if there are any other differences. Comparing the 2 – the differences between v1 & 2 can be stark- with one GP practice I am looking at going from 90% pickup of expected prevalence on the QOF register in v1 – to 10% in v2. I have asked for clarification on the residential home prevalence query and will provide an update soon. Please note that the Dementia Prevalence Calculator is being transferred to the national primary care information platform, https://www.primarycare.nhs.uk. This will be availableearly next year, and it will include the 2012-13 QOF dementia diagnosis data. CCGs and General Practices will be notified when the dementia prevalence functions are accessible via this platform. Has anyone else noticed that the prevalence figures on the quick view section differ from one table to another (prevalence and diagnosis tab and trajectory to deliver selected diagnosis rates)? This second table also seems to contradict the practice level data as well. Version 2 of the Dementia Prevalence Calculator is no longer being supported. A new version is being developed within the national primary care information platform, http://www.primarycare.nhs.uk. Version 3 will be much more refined and much easier to use with many of the data limitations of the previous version resolved. This will be available shortly, and it will include the 2012-13 QOF dementia diagnosis data. If you register for an account with primary care information platform, http://www.primarycare.nhs.uk you will have access to the new dementia prevalence data as soon as it is available. I have applied to have access to the dementia toolkit and was informed that the link would be sent to – would you be able to resend the link please. The Calculator is part of the Primary Care Web Tool and managed by the Primary Care Web Team. I suggest that you contact them by email at primarycareweb@nhs.net to request that they resend the link. I’ve signed up to the service, logged in etc, but I don’t get the option for the Dementia Prevalence Calculator ? Any idea why ? Can I get permission to access it ? Providing you have also registered your interest in testing the Calculator here https://dementiapartnerships.com/register-your-interest/ then the Primary Care Web Team will grant you access to the Calculator. The Introduction to the Dementia Prevalence Calculator may be helpful to get you started. Is there any update on when in March the calculator will be made available? CCG’s need to use this tool for planning and forecasting and its difficult to support them without any information. We expect the Primary Care Web Team to launch the in mid March. A beta version is currently available for testing via the Primary Care Web Tool. Staff in Clinical Commissioning Groups can register their interest in testing it here https://dementiapartnerships.com/register-your-interest/. Please ensure you also register for the Primary Care Web Tool at https://www.primarycare.nhs.uk/register.aspx. All feedback, including data, technical and user interface issues that arise during testing will be addressed prior to the launch. After clicking the domain “Medical”, I cannot see any Dementia Prevalence user role. Can you help me find a soultion so that I am able to access DPC, please. Please contact the Primary Care Web Tool Team primarycareweb@nhs.net to request access to the Dementia Prevalence Calculator module. How do we make sure incorrect details are amended from the dementia calculator website for Portsmouth City? Please contact the Primary Care Web Tool Team primarycareweb@nhs.net to amend the details for Portsmouth City.